A typical desk IP phone set will range anywhere from $100 to as high as $750. On the higher range the phone will be a color touch screen display with built-in Bluetooth like this. The lower range will be a simple straightforward phone like this and is often used as a lobby or common area phone. Keep in mind when you are calculating phone quantities that you should include common area phones such as lobby, kitchen, and group work areas. Conference phones for large rooms will generally range from $500 to upwards of $1,200 or more. The more expensive models have extendable microphones for large conference spaces, as well as speaker detection technology that focuses the mic on whoever is speaking at that moment. Here is an example of a higher end Polycom model. What Does the PBX Cost (Phone Server)? The brains of the operation may present the largest variable in pricing depending on the size of the implementation. For the purposes of the article I will simplify and say the price range is anything from $1,000 up to $10,000. The typical cost for an SMB-sized PBX will generally be between $3,000 and $6,000. Many features are stock on the higher-tier companies’ PBXs. Those features include a Unified Messaging suite of voice mail to email, cell phone twinning, hot desking (or hoteling), and a few others. More advanced applications such as call recording and analytics, fax to desktop products, or others (there are hundreds of potential applications) will increase the price depending on the software. Keep in mind you will also have installation costs and possible maintenance costs. McEnroe Voice & Data includes a 5 year hardware warranty with every system, but other companies may not offer that extensive coverage without charging you a lot more. Relatively speaking, a VOIP system will cost between $500 and $1,000 per phone when all of the components and pieces are factored in. It is a very basic rule of thumb, and you can very well fall below that mark, or above it, depending on the complexities and size of your VOIP phone system. 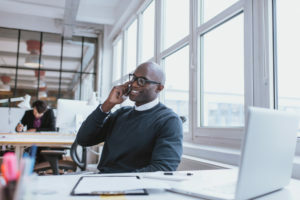 Your phone system is what connects your company to its customers, suppliers, vendors, and coworkers. People often look for the lowest price they can get when it comes to their phone system. In the VOIP era, network infrastructure, bandwidth capacity, and layers of configurations are crucial to making sure you have 100% up-time. Make sure you educate yourself about the products you’re considering before putting your company’s lifeline in the hands of the lowest bidder. At McEnroe Voice & Data, we enjoy taking a consultative approach to helping our customers design a VOIP phone system solution around their needs and specific business applications. With brands like Avaya, Mitel, Toshiba, and Hosted Star2Star, we’re setup to help you succeed on budget and on time. Posted in VOIP | Comments Off on How Much Does a VOIP Phone System Cost?